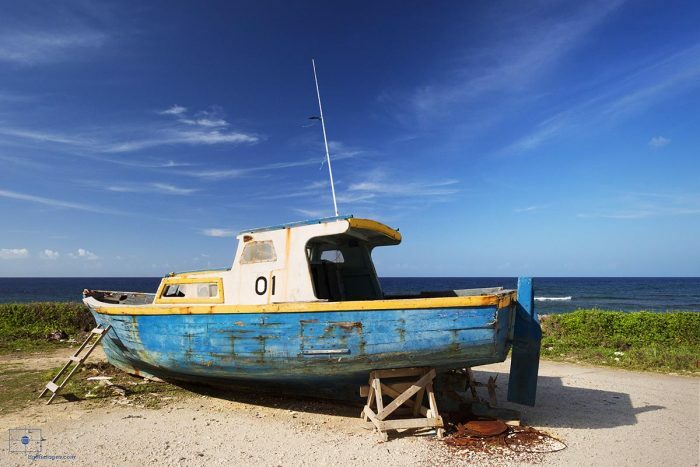 Blue fishing boat in a makeshift dry dock on the Atlantic coast of Barbados. Small fishing is a common occupation in the island nation. Blues of the sky form a chromatic harmony with the once proudly painted vessel. In the background of the image, the Atlantic shows an uncharacteristic stillness and tranquility evoking a feeling of permanence in contrast to the abandoned boat, left to decay as evinced by the peeling paint and rust.